HERCULES is “the” new benchmark for combination blades. It is made of a unique plywood composition which includes – among others – the legendary Kiso-Hinoki wood and a new type of artificial fiber. HERCULES is a match for pimple-out and Anti-Spin rubber of any type. It is the downright perfect weapon for highly disruptive balls while blocking close to the table, the ball can be returned very short and tends to “dive” considerably. This “allround“ blade also comes with a very good control that provides an excellent feeling for the ball at all times. 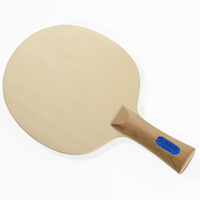 The blade can also be used for strong hitting and fast looping with offensive rubbers to put pressure on your opponent.